No kidding Sherlock… Sunday the 8th of January 2012 saw the screening of BBC’s production of Sherlock – ‘The Hound of Baskerville‘, (please note: ‘Baskerville’ as opposed to ‘Baskervilles’) to an audience of 8.16 UK viewers. This was a modern take on the famous Sir Conan Doyle’s ‘Hound of the Baskervilles’ story and was written by Mark Gatiss who also stars as Sherlock’s brother Mycroft. 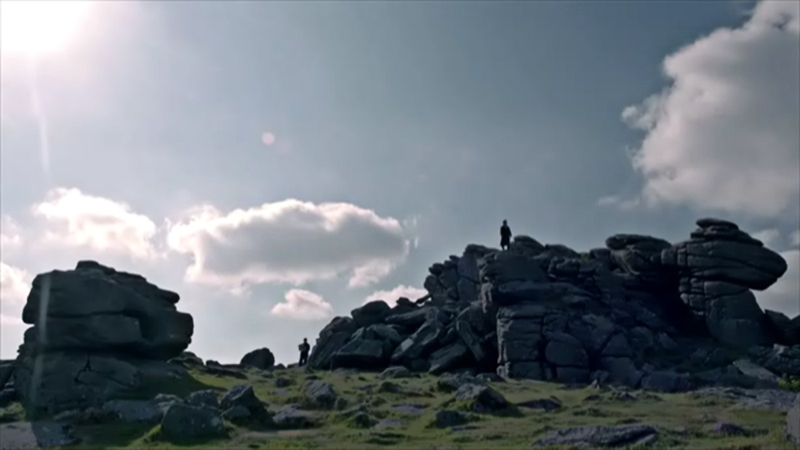 For Dartmoor lovers this certainly sent a shiver down the spine, not for the scary scenes but for the sight of a huge governmental research centre built slap bang in the middle of a moorland landscape. That said, full marks for the special effect guys for making it look so realistic. The story begins with a young boy called Henry Knight (played by Russell Tovey) who witnessed his father being savagely slain by a ‘huge hound’ which understandably effected his mental state no end. It seems that having reached adulthood he could bear the terrors no more and sought the help of Sherlock Holmes (played by Benedict Cumberbatch) and Dr. John Watson (played by Martin Freeman). Cue Dartmoor with the typical vehicle driving across moorland roads heading for Hound Tor and some moody shots of granite outcrops, atmospheric sunlight plus the ubiquitous Hay Tor. 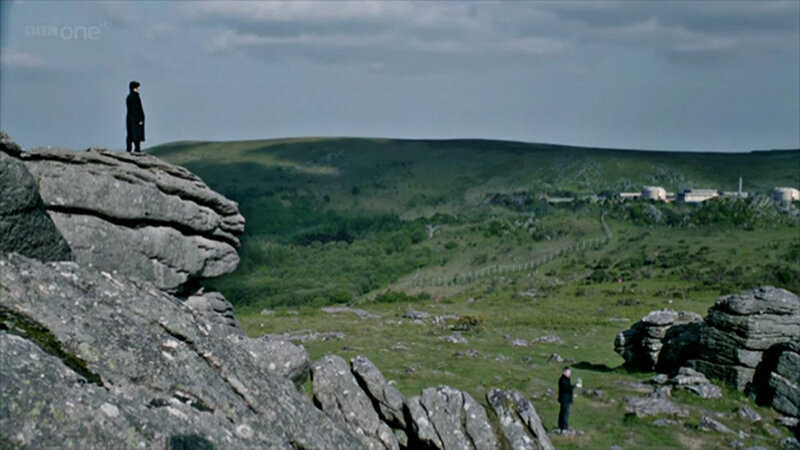 Having arrived, Sherlock scales an outcrop and surveys the 360° landscape with the help of Watson and his OS map. In one direction they see the Baskerville Research Centre (surrounded by a minefield), in another the village of Grimpen (the placename stolen from the original tale where it was the Grimpen Mire alias Fox Tor Mires) and finally Dewer’s Hollow. Dewer’s hollow was where the ‘hound’ killed Knight’s father and we are reminded that the name ‘Dewer’ is an alias of the Devil, no kidding that’s why on the moor we have The Dewerstone where the Devil haunts. Now I don’t profess to be an expert on Dartmoor places but I would say that I have a pretty extensive knowledge of Dartmoor pubs and I have never come across the one that appeared in the fictional village of Grimpen – anywhere on the moor? If I am right it was a shame they never used some of the moorland inns for this, The Rock at Haytor Vale is very atmospheric and near to Hound Tor. And I have just read and later confirmed that the inn used for this location is the Bush Inn at St. Hilary in South Wales – come on guys Whoever owns this place needs a kick up the arse because having been given an ideal marketing opportunity their website is not working. Imagine – husband, “where shall we go today”, wife “why don’t we go to the inn where Sherlock was filmed”, husband, “what food do they serve”, wife “don’t know I’ll have a look on their website, oh, it’s not working”, and husband replies “let’s go somewhere else”. That wouldn’t happen on Dartmoor! The Kross Keys Dartmoor Pub? In a similar vein the dreaded ‘Dewer’s Hollow’ seems most un-Dartmoor like and looks vaguely like a place in The Forest of Dean called Puzzlewood – dunno could be wrong. What was very true to Dartmoor life was the little cameo where Holmes meets a local lad who organises walking tours of the moor in search of the ‘Devil Hound‘, never slow to take the visitors money. Being suspicious that there is some link to the ‘hound’ and the Baskerville Research Centre Holmes and Watson con their way into the top secret establishment to take look around. I do like the subtle Dartmoor link whereby the logo for the Baskerville Centre is contained in a hexagonal box just as is the Dartmoor National Park logo (see photo below) Here they meet two scientists whilst on their inspection, Dr. Stapleton (played by Amelia Bullmore, she of the hippy woman in the Direct Line adverts) and Dr. Frankland (played by Clive Mantle of Robin Hood, Casualty, Holby City and Game of Thrones fame). Holmes then decides to pay Dewer’s Hollow a visit on one dark, misty night taking with him Watson and Henry Knight and as they get deeper and deeper into the hollow poor Watson gets separated leaving Holmes and Knight to explore alone. Whilst trying to locate his companions Watson spots a light flashing on a far off hill top, he soon decides this is Morse Code and notes down the letters U,M.Q.R.A which he takes to be some acronym of significance. Meanwhile Holmes and Knight venture deeper into the gloomy hollow where they heard the menacing howling of a hound which then reveals itself to Holmes. This encounter completely freaks him out and they all return to the pub for a stiffener and sulk, it’s toys out of the pram time for Holmes. Watson decides best left alone and ventures back out onto the moor where for me he provides the highlight of the show. Once again he spots a light flashing Morse Code and goes to investigate its source. This turns out to be a ‘dogging spot’ and a man has his belt caught on the headlight control whilst having his wicked way with some woman on the front seat, hence the flashing light which just happened to spell out letters – yeah get some of that. I apologise for not knowing where this dogging site was, certainly not Lydford Woods as there were no trees. The following day Detective Inspector Lestrade (played by Rupert Graves) turns up and they interview the two gay owners of the Kross Keys who it turns out have being buying large quantities of meat despite being a vegetarian restaurant. It transpired that they had bought a huge dog which they let loose on the moor in order to fan the flames of the legend of the Baskerville Hound thus attracting more customers, showing true traits of Dartmoor entrepreneurship. Holmes and Watson then officially return to the Baskerville Centre where it transpires that Dr. Stapleton has done some genetic work on rabbits and can make them glow in the dark which I suppose would cut the old electricity bill a bit? After hacking into a computer Holmes deduces that ‘The Hound’ is not a beast it’s an acronym (H.O.U.N.D.) for a previous research project to develop a psychotic drug that was to be used in warfare by freaking out the enemy. Now the truth will be out, Dr. Frankland was also involved on the project thus leading Holmes to deduce that he had been administering the drug in Knight’s sugar which in turn caused his ‘hound’ paranoia. Having also had some coffee with sugar at Knight’s house the night Holmes saw the ‘hound’ he reasoned that he too had been exposed to the drug, hence his sighting. Sadly some lab work proved this not to be so and so Holmes visited his ‘Mind Palace’ where he finally deduced amidst some splendid CGI which represented his memory map process something that took them back out to Dewer’s Hollow. Here they met Knight who had gone totally doolally and run up there with the intent on blowing his brains out. Finally the drama ended with the hound appearing which then turned out to be Frankland wearing a gas mask. 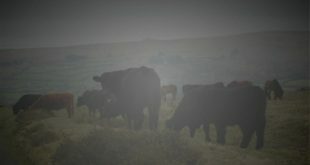 Holmes immediately deduced that the drug was in a gas form which was the swirling miasma they took to be the infamous Dartmoor fog lying in Dewer’s Hollow. This explained how it had been administered thus solving that little mystery – elementary my dear Watson. Except a real large hound then appeared but this was soon shot dead and transpired to be the couples dog from the Kross Keys which they previously said they had put down but clearly hadn’t, the little liars. Frankland by this time had taken off across the moor and ran into the Baskerville mine field where he trod on a mine blew himself to smithereens. So, what happened was, years ago Frankland killed Henry Knight’s father because he was wise to events with the H.O.U.N.D project, he then over the years administered the drug to Knight thus keeping him in a constant state of paranoia which led him to believe a genetically modified beast from Baskerville had slaughtered his father. An enjoyable programme with more twists and turns than a Dartmoor lane, just a pity a few more of them weren’t used as locations for this episode. If you have missed the programme and would like to see it then visit the BBC’s iPlayer where it’s available until the 23rd of January 2012.